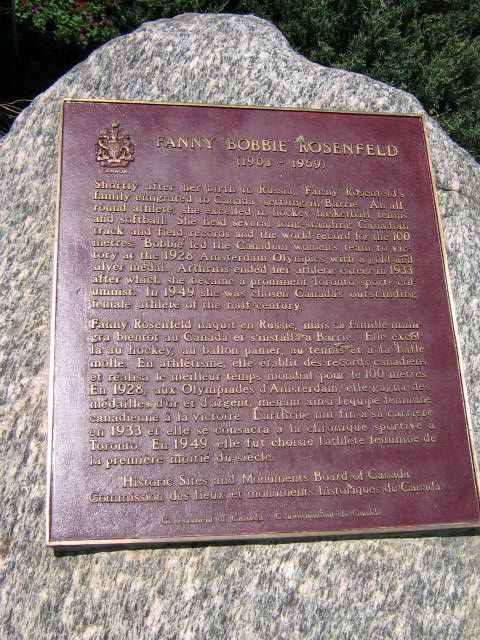 Shortly after her birth in Russia, Fanny Rosenfeld's family immigrated to Canada, settling in Barrie. An all-round athlete, she excelled in hockey, basketball, tennis and softball. She held several long-standing Canadian track and field records and the world record for the 100 metres. 'Bobbie' led the Canadian women's team to victory at the 1928 Amsterdam Olympics with a gold and silver medal. Arthritis ended her athletic career in 1933, after which she became a prominent Toronto sports columnist. In 1949 she was chosen Canada's outstanding female athlete of the half-century.